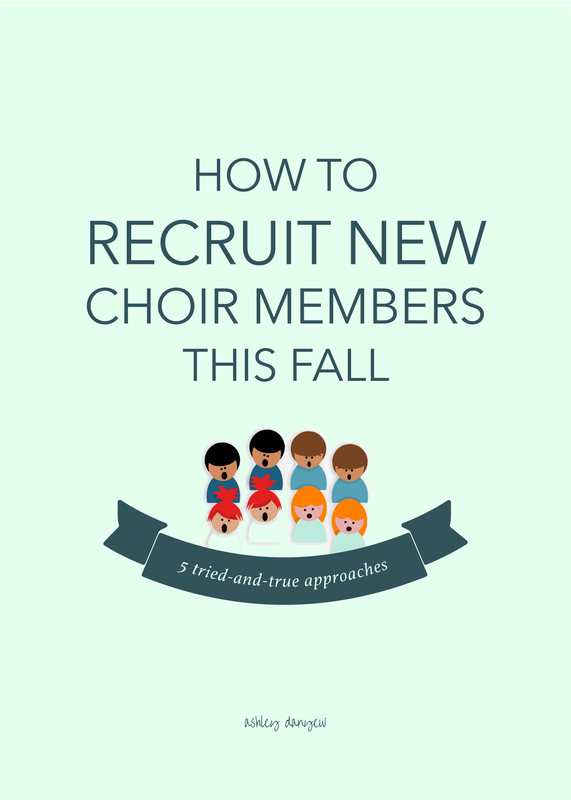 The beginning of a new choir year is a perfect time to invite and recruit a few new members. Sounds great, except for that recruiting part, right? I mean, no wants to come off sounding salesy or desperate (“Pleeease join us - we could really use some new singers!”). The good news is, it doesn’t have to be that way. Instead of thinking about selling people on all the reasons why choir is so great or feeling like you need to twist people’s arms to get them to join, focus on identifying the people within your congregation (and maybe even the community) who like to sing and want to be part of a choir and extending a warm and welcoming invitation to them. I know it may seem like the word is already out - everyone should know by now that they can join the choir at any time! - but often, people are inundated with print and digital communications to the point that they miss some things. You tune things out after a while. Make sure that you’re letting people know that they are invited and welcome to join the choir by writing something for the bulletin insert, email newsletter, and monthly newsletter. If you have a music-related bulletin board, post something large and colorful to catch people’s eye as they’re on their way to grab coffee and refreshments after the service. Believe it or not, this is still the #1 most effective recruitment strategy out there. Being personally invited to join or participate in something by someone you know and respect carries far more weight than any postcard mailer, bulletin announcement, or newsletter article. If you know people in your congregation who used to sing in the choir or are musically-inclined and not currently involved, seek them out after church one Sunday and let them know they are welcome and you’d love to have them. Depending on the size of your church and the number of people you’d like to invite, a personal, face-to-face invitation may not always be possible. In this case, a personal email or phone call can also go a long way. Let people know that you care, you notice them, and you value their gifts and contributions within the life of the church. Another way to extend a personal invitation is by encouraging your current choir members to invite those they know who might be interested in singing in choir. At the end of the choir year, encourage and challenge your choir members to reach out to one person they know over the summer and invite them to choir in the Fall. This is a great way to affirm your current members and make them feel valued. Offer to talk with those who are interested in singing, if it helps. Make yourself available after church on Sundays and by phone or email during the week - make it easy for people to reach you if they have questions. I think a lot of times, people may be hesitant to show up to choir rehearsal because they don’t want to be the only new person in a tight-knit group, and they feel like they have to make a forever commitment that first night. To counteract this, host a “join-the-choir” night, inviting people to come try choir out for a night, no commitment required. People may be more inclined to show up, knowing there will likely be other new people there, as well. Keep it fun and lighthearted and plan to have some refreshments afterward to let people mingle and get to know each other. Most of you probably do some sort of Christmas program, musical, or cantata in December. Why not invite people to come and be part of that, without having to commit to every Sunday? This works well for people who work late and can’t always make rehearsals or travel a lot on the weekends. Assemble folder packets ahead of time with everything people need to join. I like the paper pocket folders like these, in red and green, naturally. Dress it up with a customized label (this size works well) with the name of your choir and the name of your Christmas program this year. Devote part of your mid-week rehearsal (the first part of rehearsal or the last, depending on when people are available) to Christmas music every week, starting in August or September, whenever you start back. You may also consider planning a special weekend event early on - a Christmas Choir Kick-Off - to welcome new Christmas Choir members, build community, and get a jumpstart on the music you have planned. For Christmas-themed games and other fun party ideas, see this post: How to Plan an Awesome Christmas Choir Kick-Off Party. I’d love to hear: How do you recruit and invite new choir members? What has worked for you in the past?